The Gympie Gympie is an Australian plant with spindly stems and heart-shaped light green leaves. Brushing your hand against it can make you throw up from the pain. Using it as toilet paper has made people shoot themselves. This plant will ruin you. The Gympie Gympie: Endangered or Endangering? The Gympie Gympie has broad, flat leaves that rise on a series of surprisingly delicate stems. It can grow to be only a few feet tall. 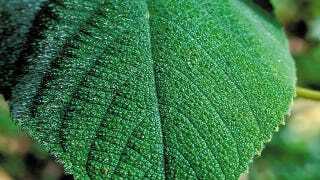 Botanists believe that its fast growth rate and wide leaves make it ideal for the small, sunlit gaps in the otherwise thick canopy of a forest. Its habitat is limited to a few patches of lowland rainforest around Queensland in Australia. Rainforests are shrinking, the climate is changing, and the Gympie has recently become an endangered plant. Many would say that endangering the Gympie Gympie is a job well begun. This innocuous-looking greenery is one of the most feared plants in the world. Its sting is so agonizing that a slight brush to the hand from one of the leaves can make a person throw up from the pain. Not that the leaves are the only dangerous part. Only the roots of the Gympie are free of the fine hairs that lodge in the skin and deliver the sting. Every subsequent moment of pressure on the hairs causes them to put out more poison into the skin. The pain feels like fire, and it lasts. As long as the hairs are embedded in the skin, the pain keeps coming. Stings from the Gympie cause the lymphatic system to go into overdrive. A person's throat, armpits, and groin swell up and ladle on the pain as the lymph nodes expand. Just being around the Gympie hurts. It sheds its hairs continuously. Scientists believe that the stinging hairs keep the ground clear so it can take advantage of those sunny gaps in the canopy. Botanists working in the field go into sneezing fits and get nose bleeds from standing near the plant. Botanists who handle hundred-year-old specimens of Gympie still get stung. Through the years, a few people have had extensive encounters with the plant. One man, who fell into a bush during World War II, was strapped to a hospital gurney, screaming, for three weeks. Another got hit in the chest in the late 1990s. For two years, his chest hurt every time he took a cold shower. No one wants this plant in their back yard, along their hiking trail, or, ideally, on their planet. This might account for why the Gympie Gympie is vanishing. Another reason, astonishingly, might be food. The plant produces edible fruit, though the fruit has been called both "warty" and "bland." That's a sad reward for nerves of steel, which is what it takes to eat the purplish berries. First, the harvester has to dress up in a full coverall suit, including a plastic face-mask because the plant can irritate the eyes (one person compared it to having acid poured on his eyes). The harvester will then knock the fruit off the tree with a stick. The fruit has to be denuded of needles by being rubbed in layers and layers of cloth, which presumably can never be used again. Then comes the nasty part. Because the needles are so fine, they can't all be seen, so "A final rubbing with bare hands will detect any stinging hairs left before eating." Hurrah. Those who run into the Gympie in the wild generally get treated with pain killers, but the stingers are both too fine and too numerous to be picked out by hand – particularly by someone screaming in pain. To get the needles out, people put the sticky parts of bandages, or home waxing strips, on their stings, and yank out the stingers the way they would real hairs. Perhaps the Gympie Gympie knows how close it is to being wiped out. In 2014, two different trees have been found with all the parts seemingly intact, but with no toxin in the silica hairs on the leaves. Although no one is entirely sure what causes the overwhelming sting, scientists believe that it's a peptide called moroidin. Remove that one component, and the plant's ability to cause pain is gone. Exactly why the plant would lay down its arms is unknown, but perhaps one day it will only be an agonizing legend. Top Image: CSIRO, Second Image: C Goodwin.